Roksan Blak CD Player has advanced far beyond the already award winning K3 CD and Caspian CD player models to offer reference level CD replay. If you're building a system from scratch is an excellent match for the Roksan Blak Amplifier. It features 3 digital and 2 analogue outputs for use with or without a separate DAC. Available in charcoal or anthracite (please note opium finish is discontinued and no longer available). 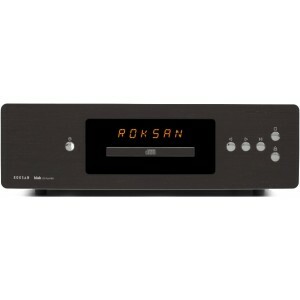 Roksan Blak CD Player is undoubtedly the finest sounding player Roksan have designed and produced. It utilises some of the finest electrical components available and a superior CD drive. This works with the progressive circuit strategy, an advanced whole isolation scheme for the device and remarkable battleship-grade build class. The all new DAC chipset is built for optimal detail retrieval and the CD mechanism is totally isolated in order to eliminate vibration.